After spending an extra day to rest in Finisterre and also waiting for Mike and Cinzia, we have decided to take the bus to Muxia. 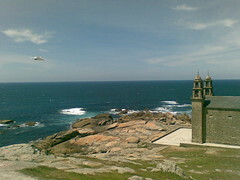 This is the place where Mary is to have landed in Galicia to hear St. James preach. The church is dedicated to her.